The Quad City Wind Ensemble is a non-profit organization created to enhance the musical arts of the Quad Cities and surrounding areas. In addition to dedication to performing music in a variety of styles, the QCWE focuses on the promotion of music education. The QCWE was formed in February of 1987 by Dr. Charles B. DCamp, then Director of Bands at St. Ambrose University, in conjunction with a small group of highly motivated musicians. Today it is one of the premier ensembles of its kind in the country, being comprised of the area’s finest wind and percussion players who audition for membership in this select group. 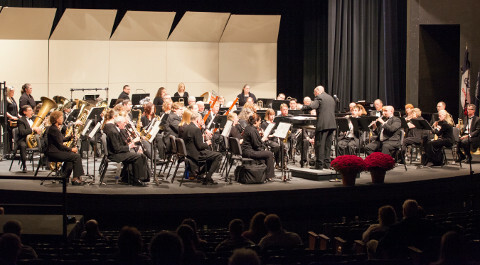 QCWE has performed numerous civic events in the bi-state area, including performances in Allaert Auditorium, located in the Galvin Fine Arts Center on the campus of St. Ambrose University. The QCWE has also been invited to perform at prestigious musical events such as the annual conventions of the Iowa Bandmasters Association and the Illinois Music Educators Association. The Ensemble is also dedicated to music education in public and private schools. All participants in school band programs are given free admission to QCWE performances. 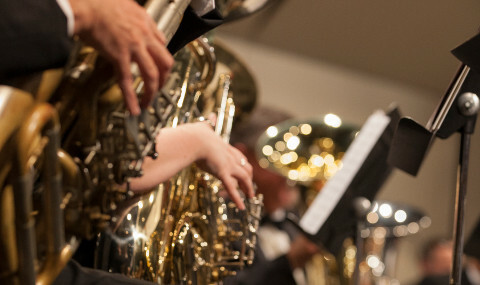 In addition, the renowned Quad City Wind Ensemble Solo Competition entices the area’s most talented musical youth to audition for a cash scholarship and performance as soloist with the QCWE in a concert. The QCWE receives support from numerous sponsors and supporters, including St. Ambrose University, special state and private funding agencies, advertisers, active members, and private and corporate donors. Funds raised are used to finance the musical director and guest artists, acquisition of new literature, periodic commissioning projects, travel to important musical events, and the Quad City Wind Ensemble Scholarship Fund. For information on how to become a Sponsor or Supporter of the Quad City Wind Ensemble, please contact us at info@qcwindensemble.org.